Since when was it not good enough to just be exactly who you are? Who is making up these rules of perfection? Why are we listening to them? I struggled with body image, and still do some days, for years. I am a 35 year old Mother of two, who has gained and lost weight more than once. I have struggled with binge eating disorder, had 2 babies and back surgery. My body has been through hell and back and I have the scars and loose skin to prove it. Do I love these things about my body? In all honesty, no. But, would I do it all over again to learn the lessons I learned and have the freedom I do today? You betcha I would. I was looking through pictures from college this weekend and had a few moments of, “Why did you think you were fat? ?” Looking through those pictures made me realize that even though I looked healthy and trim… I wasn’t healthy at all and that what people perceived as “healthy”, in reality, wasn’t. My degree was in Health Promotion, I was a fitness instructor, and a Weight Watchers member… people would have thought I had this all figured out, right? I was lying to myself and everyone around me about how I was staying in a healthier weight range. Bingeing and restricting might have kept me around the same weight, but I lived in a prison inside my own body. I’ve broken out of the prison, but there are days that I feel the pressure of our society to be perfectly toned, and like I should still have the body of my former teenage self. News flash… under the compression leggings and workout tops there is a body that has LIVED. This is not easy for me to say or do. I can remember being in therapy and in the middle of a session my therapist closed her notebook, set it aside and looked at me and said, “Amy, I have never met someone with such negative self talk before.” I remember feeling stunned. Really? Other people didn’t hate themselves like this? I thought I was somewhat normal? Come to realize, I wasn’t. I saw myself as a complete failure and hated every single part of my body… except my eyes. My eyes are the only part of me I’ve never complained about. How sad is that?!? Fast forward to today and I have slowly learned to love the woman I see in the mirror and be proud of my body and where it’s come from. 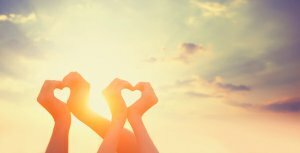 This practice of loving myself is not always easy and some days are easier than others. Though I’ve come a long way, this is still an area I work on, I believe I always will. But, here are a few things I’ve learned. My body is stronger than I ever realized. In a 5 year time span I was pregnant 3 times, had one miscarriage, had two boys via c-section and had back surgery. My body is more resilient than I had ever given it credit for, and it took some dark days for me to appreciate what it can do regardless of cellulite, the number on the scale or the size of my clothes. My scars have a story that no one else has. My scars tell my story. They tell the story of a girl who hated herself and was redeemed by the grace of God, and today, she is thankful for the story He gave her… even though it all came at a price. My story is MY STORY. My story has the ability to help others, and for that, I am thankful, and I will not be ashamed. I will always be a work in progress. One day I think I have it all figured out, the next day life throws me a curveball and I feel defeated again. This is life. That does not mean I throw in the towel. This does not mean I quit. This means I have a new opportunity to learn how to be stronger in the midst of chaos. Life is not perfect, when I can embrace that, it suddenly becomes a lot easier to manage and accept. 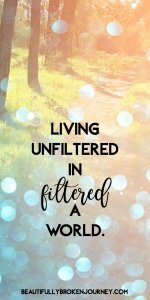 In this “filtered” world I encourage you to live a little more “unfiltered”. Share the ugly parts of your life that you think no one will understand. I lived in hiding for many years. I didn’t share what was really going on inside of me because I didn’t think anyone would understand. The day I began sharing my story was the first time I realized what true freedom feels like. Now, I live unfiltered and when I share my story I feel freedom. I have learned to embrace my brokenness and share it to give others strength and hope that their brokenness doesn’t mean failure, their brokenness can mean freedom, too. Love yourself, love others, and never apologize for the story God gave you. Living unfiltered in a filtered world isn’t always easy, but, He gave you your story for a purpose… and I promise you, you can change someone’s life just by sharing it. I’m inspired by your transformation. I am looking for motivation to kick start my weight loss journey. Are you on connect? I can totally relate to this–as I am sure many can!! Still learning to see myself as He sees me–it’s a battle!! Hi Rikki, it can be a battle but I’m so glad you are doing it!